With its unrivaled location and Michelin-starred cuisine, Aroma offers guests spectacular views and memorable dishes in equal measure. Chef Giuseppe di Iorio’s menu features nostalgic classics and newer, more imaginative creations, giving visitors a snapshot of modern Italian cooking at its best. It is hard to imagine a more spectacular setting than the one at Aroma. 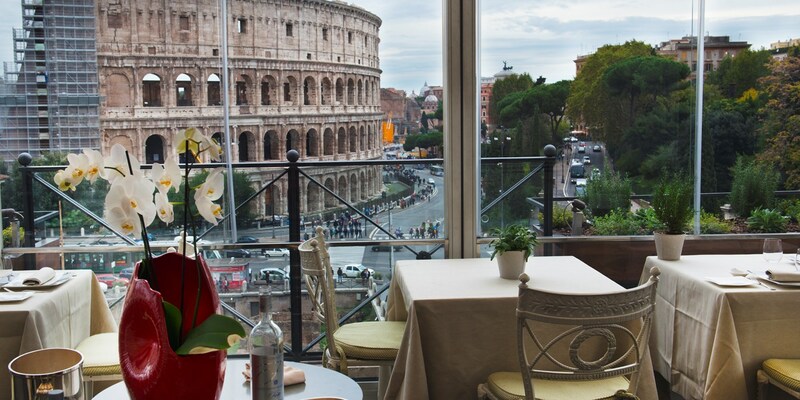 Occupying the top floor of the Hotel Palazzo Manfredi – a seventeenth century multi-storey villa built on the archaeological remains of a gladiator barracks – the restaurant overlooks the dome of St Peter’s Basilica and the Roman Colosseum, which is just a six minute walk away. 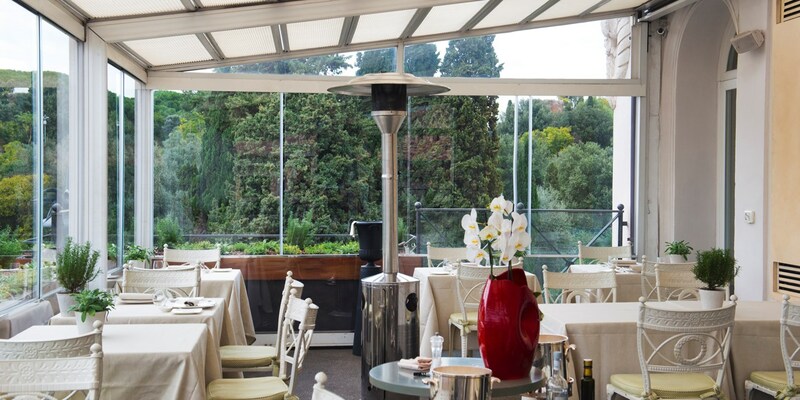 Perfect for a romantic meal or special occasion, head chef Giuseppe di Iorio has crafted a sophisticated menu that is equal to its breathtaking location. With such a winning combination, it was no surprise that Aroma was awarded a Michelin star in 2015. Although technically a hotel-restaurant, Aroma is open to all seven days a week. The one exception to this is breakfast, which is reserved for hotel guests only. The menu is built around the finest local ingredients, which are brought back from the local Roman markets every day. Diners will be treated to a number of intriguing dishes such as Coffee-marinated codfish, Octopus in a glass with parsley foam and Boiled cheek of veal with grapefruit sauce and curry chips. There are two tasting menus; one showcasing Giuseppe’s unique creations and another comprised of regional specialities. Fortunately for diners, dishes from both tasting menus are available on the à la carte menu, allowing guests to experience the best of both culinary worlds. When it comes to wine, guests are spoilt for choice – head sommelier Martin Pechev has assembled a wine cellar of 400 labels. This includes wines from all over Italy and an interesting selection of New World wines, certain to excite the most seasoned of connoisseurs. Sophisticated cocktails and Champagnes are also available at the restaurant’s trendy American bar, where guests are invited to relax with their chosen tipple on Palazzo Manfredi’s spectacular outdoor terrace. Aroma has a smart casual dress code. Gentlemen are required to wear trousers and a dress shirt. Shorts, sleeveless shirts and sandals are not permitted. Hotel guests are unlikely to run out of things to do. The Vatican Museums, Sistine Chapel, Roman Colosseum and St Peter’s Basilica are all nearby. The restaurant’s dining space can be booked for private events such as weddings, business functions and canapé parties. As a child, it wasn’t standing by his grandmother’s side as she cooked or spending time in the Italian countryside that piqued Giuseppe di Iorio’s interest for food. It was the scents and colours of the market, along with his mother’s innate ability to pick the very best fruit and vegetables on offer, that made him decide to become a chef. 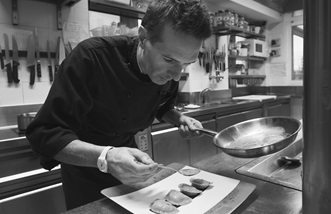 This passion for produce is still with him today, as he heads up the Michelin-starred Aroma restaurant on the top floor of Hotel Palazzo Manfredi. Born in Calabria, Giuseppe soon made the move to Rome to attend catering college. After graduating, he completed a lengthy apprenticeship in local restaurants, before training at Il Margutta, one of the capital’s top eateries. He eventually found himself in London, working under Giuseppe Sestito – the first Italian head chef of the Grosvenor restaurant at the Hyde Park Hotel. It was here that he discovered a true love of beautiful food and intense flavours.